Thus, whilst originally I thought I'd be away on Holiday playin' in Duh Sand Dunes, along with continuously playing 'Ketsup on 'Der Bloggenspot; Ja-Ja! Here's a few F1 tidbits which tickled my fancy over the past few weeks whilst continuously scouring De Vurld 'O Motorsporten, Ja Volt! First heard about this via Adam Cooper's F1 blog, noting how Pirelli planned to run some experimental 18" rubber's at the in-season Silverstone test. As the chassis in question was the Lotus E22, surprisingly for Mwah, with ex-Marussia-Caterham F1 driver Charles Pic at the wheel, being unawares that the Frenchman had been signed as a Lotus Reserve Driver this year. With Grizzled Journo' Joe Saward giving a good insight into the thoughts upon running 18-inchers in the future along with a pic' (Pun intended) of the prototype Pirelli tyre. Since I couldn't SEE I-T! I don't have an opinion to form upon thy 'Wee Willie Buxom's (Will Buxton) latest blog post titled Benching Kimi, which surely won't happen at 'Der Hockenheimring since the allure of the Finn plus la Scuderia is simply too overpowering, right? While apparently thy 'Wee Willie Buxom' set off a Firestorm with his rant upon thee 'Iceman being banned from the German GP, which Y'all knew wouldn't happen, as its a fair argument. Does the Scuderia and its drivers deserve preferential treatment? So while thee young "Louise 'JAGUAR" Hamilton continues taking swipes at his team-mate 'Brittany, nee Nico Rosberg, who is German after all; Ja Volt! Rosberg has been on a bit of a Dream Week lately. Having first married his girlfriend Vivian Sibold, then 48-hours later watching his home country win this year's world cup One-Nil' (1-0) over Argentina, before the 29yr old driver had his long anticipated contract extension; reportedly a 3yr deal for Euro $55m, announced just day's prior to contesting his second home Grand Prix at 'Der Hockenheimring. 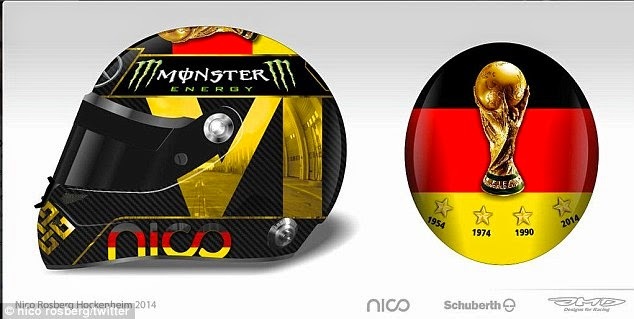 Meanwhile, in a fitting tribute to his home country's win, Nico Rosberg has revealed his new world cup inspired theme helmet he'll wear during this year's German GP. After all, with his new contract signed, he can afford it! OOPSADAISY! As FIFA's being STUPID by having a hissy-fit over Nico using a picture of its trophy; SHEISA! As I just DON'T understand why FIFA wouldn't want the FREE publicity?